Anyone who fancies owning their very own open source and hackable miniature humanoid robot, might be interested in a new robot kit called the Ai.Frame. 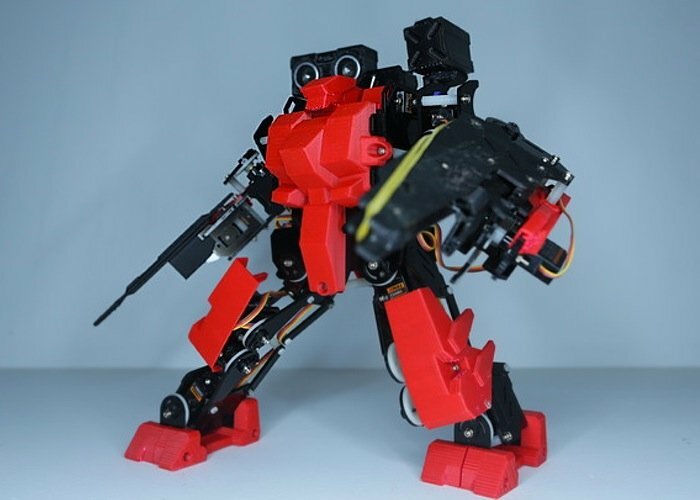 The Ai.Frame robot kit has been designed to provide owners an open source robot that can be customised both with command as well as preassembled or self-assembly modules to add extra functionality. The Ai.Frame robot is powered and controlled by smart servos and sophisticated sensors, and is available in three distinct models Apollo, Apollo A and Apollo B with a multitude of colour options available to choose from. The robot kit can be purchased either pre-assembled or as a self-assembly robot kit depending on your skills and time constraints. Check out the video below to learn more about this open source robot kit. For us, robots are childhood mermories, filled with sounds of joy and laughter as well as expressions of curiosity and amazement. We at Ai.Frame team want to share our experiences with you through our products, for us inventing robots is fun, it’s passion, filled with endless possibilities. The Ai.Frame robot kit project is currently over on the Kickstarter crowd funding website so if you would like to own an Ai.Frame robot, visit the Kickstarter website now to make a pledge and help Ai.Frame become a reality.